The cutesy charm of other Fred and Ginger films, like Swing Time or Top Hat, never become overbearing – an oddity, given the artificial nature of musicals. But the way both Swing Time and Top Hat integrate a poignantly simple love story with splendid dance sequences are so genuinely pleasing that you’re likely to be swept off your feet before picking up on their narrative foibles. Such is not the case for Follow the Fleet, a Fred and Ginger film that was produced sometime during the year long period between Top Hat (1935) and Swing Time (later in 1936). Follow the Fleet’s narrative places Fred and Ginger lower on the social spectrum, with Fred Astaire as Bake Baker, a naval officer. He misses his old dance partner in Sherry (Ginger Rogers). With Bake’s fleet back in San Francisco, he happens to saunter into a seamy dance hall. There, he encounters Sherry – she’s had better dancing days too. Meanwhile, a nerdy girl named Connie is smitten over Bake’s sailor friend, Bilge (the impeccably dull Randolph Scott). Connie is Sherry’s sister, so it only makes sense that the two couple’s scenarios weaves in and out of each other. Follow the Fleet’s biggest offense is how it holds off on having Fred and Ginger together at any given time. The two are conspicuously absent of each other’s presence for the film’s initial 30 minutes. And when they finally do get together, their dance sequences are bogged down with a secondary narrative that only hinders the emotional gravity of the dance numbers that we are witnessing. While technically proficient, Follow the Fleet proves that a musical thrives on some sort of rudimentary plot to keep the artificial nature of its scenario afloat. Follow the Fleet unfolds in a lazy and utterly perplexing way – it’s as if they’re making it up as they go. And even my fierce dislike for Randolph Scott doesn’t hide the fact that no couple should be positioned against Fred and Ginger when it comes to drawing affection. Follow the Fleet can’t even function as a bridge picture from Top Hat to Swing Time. It’s sandwiched in between two films that are remarkably similar. Something like The Story of Irene and Vernon Castle departed from the typical tropes of Fred and Ginger films by placing its characters in a more narrative-driven context. 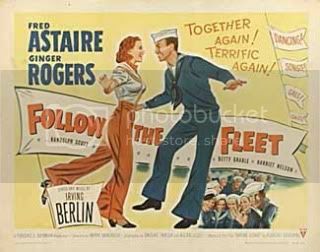 In a way, Follow the Fleet exists as a solemn example of how confining and precise Fred and Ginger films needed to be – and that perhaps singing and dancing ought to be exclusive to the rich.